Lucie is a cute and funny little girl. She's always cheerful, a little mischievous and even quite stubborn sometimes, but when you get to know her better she's a very gentle and caring soul. She wants to love and be loved no matter what! 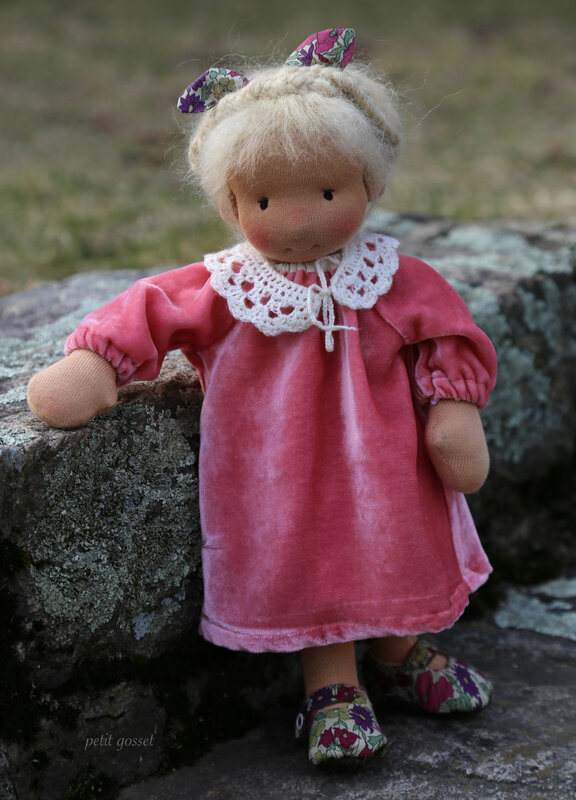 Lucie is about 14" long and made with swiss jersey and stuffed with clean and beautifully-smelling eco-wool. Her face has been sculpted with needle-felting techniques, brown eyes - embroidered and cheeks - blushed with beeswax. Her hair is made of mohair crocheted into a wig and attached tightly to the head. Lucie comes wearing a lovely silky velvet dress with a detachable crochet collar, a pair of lovely underpants, made with organic cotton batiste and trimmed with fine lace, and a pair of Merry-janes, crafted with Liberty print and wool. If you would like to invite Lucie to your home, take a peek in my Etsy store.